When you imagine a steaming pot of cabbage soup, your mind naturally adds meat to the ingredient list, some kind of ground beef or pork, yet it doesn’t have to be this way. 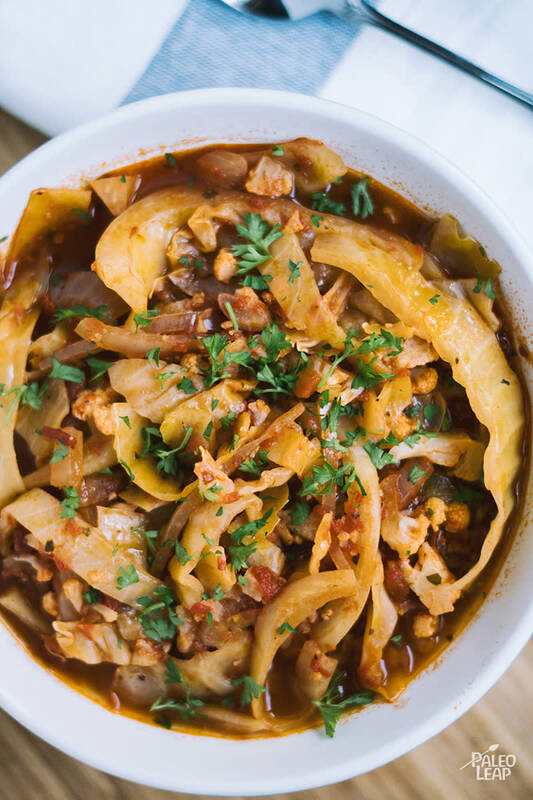 A soup without meat can be refreshing, hearty and wholesome all the same, as in the case of this vegetable cabbage soup. Let’s start off by saying it is a humble soup, but in a world of super-charged, over-flavored meals that look better than they taste, this soup will get you grounded and bring you right back down to earth. All of the ingredients are readily available, they are basic, yet not old-fashioned – in fact they are timeless. Your grandparents could have easily made the same cabbage soup, and their grandparents before them. Of course, they would have had to grow some of their own vegetables in a garden to achieve such a multifarious soup, but with modern conveniences (farmers markets and grocery stores) we are in luck and can make just about anything that we fancy at any given time – no growing, foraging or hunting required! You can, and should, be proud of making such a simple soup, either as a main course or an appetizer. All the vegetables go in the pot at once, the mass is brought to a boil, then lowered to a gentle simmer. Done. If you are up for soup and salad, why not try a beet, broccoli and mache salad with almond vinaigrette on the side to bring about some modern simplicity to the meal. Place all the ingredients in a large saucepan. Bring the soup to a light boil over medium-high heat. Lower heat and bring to a light simmer, then cover. Let the soup simmer 45 to 50 minutes, or until everything is soft. Adjust the seasoning and serve with fresh parsley.